Wood's UV light. An essential aid for the diagnosis of neurophakomatoses such as TS. Battery operated. 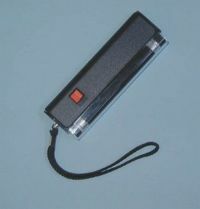 Hand Held UV light. An essential aid for the diagnosis of neurophakomatoses such as TS. Battery operated.